Chris Cooks' extravagant, three-part denizen of the deep adds a dramatic statement to green spaces. Like the great watery beasts of fictional lore, this land-bound beast brings the fantasy to life. Chris Crooks' extravagant, three-part denizen of the deep adds a dramatic statement to green spaces as he leaps energetically through waves of grass and inspires uproarious reactions from all who cross his path. Crooks crafts each giant from monstrous pieces of hand-cut metal that are aged with a bright rust patina. He then bends and shapes the tentacles, scales and other dragon-like details, giving the piece added ferocity and dimensionality. Steel segments affixed with mounting brackets that hold two, 6" stakes (six stakes included). Handmade in Arizona. Rust patina will become darker and richer with age. Excellent description and quality. Very pleased with it in my landscape. A classic addition to any outdoor space that will bring a smile to anyone's face. easy to set up. Great quality looks great. Smaller than I thought, but I love it! I planned to put it by the tortoise's tunnel, it is so striking it went by the big fountain instead, where it can be seen better. I saw an amazing Sea Dragon at the Botanical Gardens in Fort Bragg, CA. The one there was $24,000 and was already sold but donated back to the Botanical Gardens. 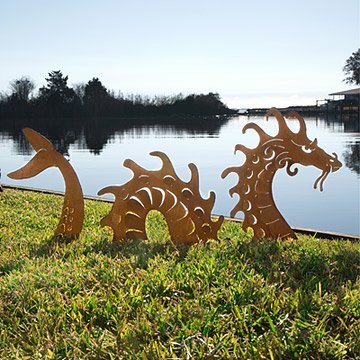 Since I don't have that kind of cash for yard art, and was looking for something fun for Mother's Day, this was the perfect gift! Sculpture smaller than I had pictured. Probably meant more for a small area or garden. Have painted/weather proofed with a copper finish. Placing in back yard on Indian River (Intercoastal). There are 2 other dragon garden sculptures in my neighborhood. So we wanted to carry on this theme. This was the best one we found online. Couldn't be more pleased. Well made and cleverly designed.